Antelope hotel is the perfect blend of luxury and tradition. 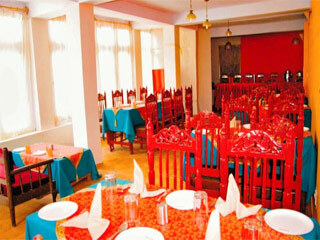 Run by local Ladakhi family it has been constructed and furnished with all the modern luxuries. Centrally located on the foot hills of Leh Palace surrounded by green willow and popular trees with a stunning view of Stok Glacier on the north and Khardungla Pass on the south, its breathtaking exteriors only complement the inside. A beautiful and serene garden for relaxing in seclusion yet just a 5 minute walk down to the main market through the famous shops of local bread makers (Nan vaies). Wedding Services, Family/Child Friendly, Conference Hall, Laundry Facilities, Travel Counter, Secretarial Services, Safe Deposit Box-Front Desk, Elevator/Lift, Backup Generator, Complimentary Newspapers in Lobby. H/C Water, Microwave, Wakeup Calls, Shower Caps, Bathtub Only, Toothbrush/Razor on Request, Internet Access, Complimentary Toiletries, Desk, House Keeping. User reviews for "Antelope Hotel Leh"